Most Stekys were made by Riken, makers of the Ricoh cameras, but it all depends on what you consider a "steky". We've cast the net wide and included cameras that do not have the Steky name on them, but are in the same "familiy". There is a certain confusion surrounding the lens mount on these cameras. Certain authors have written that these cameras will accept movie cameras lenses. This has increased the demand for these cameras, but the rumor is not true. While it is true that most of these cameras have an interchangeable screw mount lens, it is not compatible with standard movie lenses. Movie lenses come in two universal scrw mounts mounts called "C" and "D". The C mount was designed for 16mm movie cameras and is is 1 inch wide (25.4mm) with a pitch of 0.03125 inches (0.79375mm). The smaller D mount was designed for 8mm cameras and is 5/8 inch wide (15.875mm) with the same pitch. It's hard to imagine that the Steky would have been made with either type of movie lens in mind. First, the Steky was designed in Japan just after World War II. The country used the metric system, not inches, and at that time the country was impoverished. Everything, including photography, was very expensive. 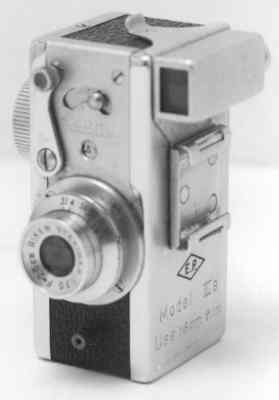 The Steky camera was made small so that it would be inexpensive to use. It is inconceivable that they would have designed the camera for expensive movie lenses that no one could possibly afford and were impossible to find anyway. Similarly, it was built to be a subminiature camera. Movie lenses of the time were all large and heavy -- completely inappropriate for a camera of that size. Some authors have written that the cameras used C mount lenses, some say D mount lenses, and others just say "movie lenses". But the Steky obviously was not designed for either. The C mount lenses, which are designed for cameras that used 16mm film -- just like the Steky -- are way too big for the camera mount. The C mount is nearly 25mm wide while the Steky lens mount is on 16mm. The C mount lenses are actually wider than the Steky camera body! And although the D mount lenses will loosely fit on the Steky body (which has a screwmount size of 16mm with a pitch of 0.5mm), you are asking for trouble. First, since the D mount lenses are designed to be used with 8mm cameras, not 16mm like the Steky, you won't be able to focus an image on the film. The lens needs to be much closer to the film than the Steky body allows. More importantly, if you try to put a D mount lens on a Steky, you risk stripping the threads on the camera body, and thereby rendering the camera completely useless. So ignore all these authors, even if they show you pictures of a movie lens on a Steky. A few specialty lenses were made for the Steky, but these are few and far between. Just be happy that Steky/Ricoh made good quality cameras and that these subminis are still easy to purchase today. A final note about lenses: the Steky and the Ricoh used the same lens mount so the Steky lenses will fit on the Ricoh and vice-versa. To top it off, these Steky/Ricoh cameras did not all use the same cassette. The first few generations of Steky cameras used two small cassettes for film -- we'll call this the Steky cassette.. The later Steky/Ricoh's used a much larger double-lobed cassette that we'll refer to as the Ricoh cassette. The Steky cassette will not fit in the later cameras, nor will the Ricoh cassette fit in the earlier cameras. All Steky's were designed to use double perforated film, but single perf will work as well. Unperforated film is a problem since the camera was designed to use the perforations to advance the film and film counter. Despite this, people have reported that unperforated film will work if you advance the film slowly. Here is a list of 16mm cameras manufactuered by Ricoh or that used the Ricoh/Steky cassettes, in chronological order. (1946) -- 25mm (f3.5-16); B, 1/100. This rare submini was styled like the Steky and manufactured by Zuiho Optical. Prototype of the Steky, and uses the same cassettes as the Steky -- if you had any doubts. The fixed-focus lens had adequate depth-of-field. Probably the first Japanese camera to use 16mm film -- not available in Japan at the time. (1947) -- Interchangeable, three element, 25mm (f3.5-11) lens. The focus is fixed at around 12 feet and had adequate depth-of-field. Shutter speeds of B, 1/25-1/100 . Made by the Asahi Musen company, the first Steky submini had a fixed-focus lens that was unique among subminins because it was interchangeable. It is often listed as the first Japanese camera to use 16mm film. It would be more accurate to say that it was the first "successful" Japanese camera to use 16mm film, since its predecessor used 16mm -- a year earlier. The image size was 10x14mm. It was made during the military occupation of Japan, and all manufactured materials at that time were supposed to be marked accordingly -- "Made in Occupied Japan", also known as (AKA), "MIOJ". There are apparently several examples of this camera that are NOT marked "Made in Occupied Japan". Some were marked "Made in Tokyo" and other marked "Made in Tokyo Japan". Others were not marked at all. If it had an inscription, it was stamped on the side, near the bottom of the camera. Since it's possible that cameras were made BEFORE and AFTER the occupation that are not marked "OCCUPIED", it's hard to known when any particular camera was actually made. There are no differences in features for these various models, which some authors suggest ran to 1953 -- well past the time of occupation. But since we have examples of the Steky II that are marked "MIOJ" we can assume that the Steky I production ended before the occupation ended. This suggests that any Steky I without a MIOJ mark was produced BEFORE the occupational requirments were strictly enforces, and is a very early version. But collectors love this model since the markings are numerous and the dating is confusing. Steky aficionados can work themselves up into a lather over the model I. Just don't get it on the camera, OK? (1950) -- Interchangeable, fixed-focus 25mm (f3.5-16); B, 1/25-1/100. The focus is fixed at around 12 feet and had adequate depth-of-field. This, and all subsequent Steky cameras, was made by Ricoh Optical comapny. This version added several accessories, such as a 40mm (f5.6 - 16) telephoto lens, a 40mm (f3.2 - 16) lens -- both focusing to 3.5 feet -- and a 17mm wide-angle slip-on converter, filters (UV, red, green, 80A), lens hoods, cases, pocket tripod, flash gun, viewfinder masks, clip-on viewfinders, and more. The camera body is the same as the model I -- just the optics changed slightly -- but it is clearly marked "MODEL II" on the side and is often marked "MADE IN OCCUPIED JAPAN". (1952) -- Interchangeable, fixed-focus 25mm (f3.5-16); B, 1/25-1/100 . This was a black model with an accessory angle finder used by the police. The McCarthy era mentality ruled in Japan as well as in the US, and many camera companies made police versions of their submini cameras during this time period. Fortunately, very few were made, but they are now very rare and sought after by collectors. (1954) -- Interchangeable, fixed-focus 25mm (f3.5-16); B, 1/25-1/100. The focus is fixed at around 12 feet and had adequate depth-of-field. This version was just like the model III except that a slightly larger shutter release lever was added. In addition, flash sych added with a PC connection on the front of the camera..
(1955) -- Interchangeable, fixed-focus 25mm (f3.5-16); B, 1/25-1/100. The focus is fixed at around 12 feet and had adequate depth-of-field. This version was just like the model IIIA except that a cold flash shoe was added to the side of the camera. (1957) -- Interchangeable, fixed-focus 25mm (f3.5-16) lens. The focus is fixed at around 12 feet and had adequate depth-of-field. Speeds of B, 1/50-1/200. The vertical style was gone; the camera was redesigned to look like a small rangefinder camera. To add to the appeal, the camera had a bright gold finish -- real gold plating!. Even the viewfinder (with marks for the tele lens) is gold tinted. The shutter speeds were bumped up slightly, which helped avoid blurred pictures. A gold-plated 40mm telephoto lens was available, but apparently in different styles. We have read about f4.5 and f5.6 versions. The f5.6 version is a focusing lens (as is the f4.5) and focuses from 3.5 feet to infinity. It did not have a filter thread on the front. The camera has flash synch. The knob-winding film advance of the Steky was also gone; a standard film advance lever was added. With a threaded cable-release socket and tripod socket this is a very capable camera. With this model a new cassette for the film was used -- we'll call it the Ricoh cassette. It was much larger than the Steky cassette and double-lobed. It was used in all Ricoh 16's as well. (1957) -- Same as Golden Steky. The focus is fixed at around 12 feet and had adequate depth-of-field.